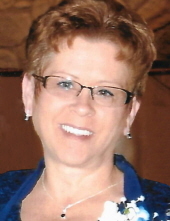 Evelyn Jean Mendenhall Shay, age 50, resident of Ripley, OK passed away Tuesday, October 16, 2018 in Tulsa, OK.
Friends and loved ones may pay their respects at the funeral home from 10am-8pm Thursday, October 18, 2018 with the family present to greet friends from 6pm-8pm. A funeral ceremony to celebrate Evelyn's life will be held at 10:00 am, Friday, October 19, 2018 at the Trout Funeral Home of Perry with Brian Friend officiating. Following the ceremony, she will be carried in her pickup and laid to rest at Morris Heights Cemetery in Orlando. Evelyn's casket bearers will be Kaleb Mendenhall, Kolby Mendenhall, Tyler Hogsett, Austin Hogsett, Jace Vaughan and Brett Alexander. Arrangements are under the direction of Trout Funeral Home of Perry. Evelyn was born on January 18, 1968 to Royal Alfred Mendenhall and Evelyn Earlene Reger Mendenhall in Pampa, TX. She was raised in the Perry area, going to school there before attending Central Vo-Tech where she received her training to be a licensed practical nurse. After college, she worked for the county jail where her skills in nursing saved lives. Evelyn met her husband Harry "Rusty" Shay one fateful day while she was mopping the floor at the gas station where she worked. He told her she could mop at his house and she colorfully responded with a "no" and a few more choice words. Anyway, he found out where she lived and stopped by to check on her cable connection. As they say, the rest was history. They were married on November 23, 1994 in Perry, OK and celebrated nearly 24 years of marriage. Evelyn maintained her faith membership at Calvary Baptist Church. Being the crafty sort, Evelyn creatively made jewelry for her friends and family. Her jewelry was so popular, she began selling it on the web. When she wasn't working or being crafty, Evelyn was in her garden planting flowers or on the front porch watching her beloved hummingbirds. She cared much for others and her loving presence will be missed by all who knew her. Survivors include her husband Rusty Shay of Ripley, children: James Nathan Chiasson and wife Cayla of Billings, Marylin Chiasson of Ripley, parents Royal and Earlene Mendenhall of Perry, brothers: Roy Mendenhall and wife Stephanie of Oklahoma City, David Mendenhall and wife Susan of Perry, sister and brother in law Deaunna and Steve Thomas of Blue Mountain, AR, aunts and uncles: Mary and Neal Fulton of Pampa, TX , Gene Miller of Pampa, TX as well as numerous cousins and dear friends. Evelyn was preceded in death by her parents in law Harry and Leota Shay, sister in law Rhonda Lynn Shay, grandparents Evelyn and Wilburn Earl Reger as well as Katherine and Howard Mason, aunt Linda Miller, uncle Wilburn Reger and cousin Charles Bledsoe. Memorial contributions may be made to the American Heart Association, in care of Trout Funeral Home, 1408 N. 7th Street, Perry, OK 73077. To send flowers or a remembrance gift to the family of Evelyn Jean Shay, please visit our Tribute Store. "Email Address" would like to share the life celebration of Evelyn Jean Shay. Click on the "link" to go to share a favorite memory or leave a condolence message for the family.